This Sunday, April 10, at 4pm, our Adult Choir will participate in the annual Western Crescent Choir Festival. This year, the concert will be held at the Rockford Unitarian Universalist Church, 4848 Turner St., in Rockford, Il 61107. This is the third year our choir has participated in this festival that is open to the public. 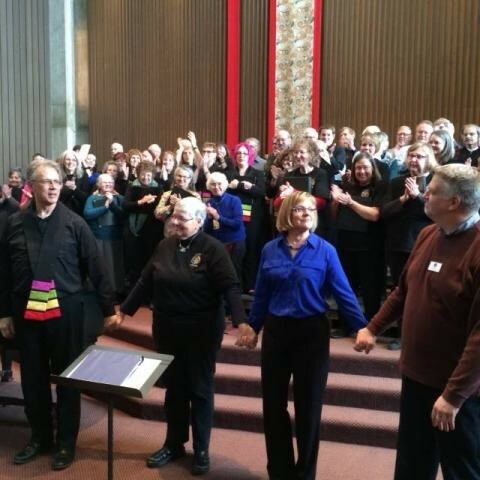 In addition to our Adult Choir, the concert will feature singers from neighboring UU choirs west of Chicago, including the Unitarian Universalist Church of Rockford, Elgin Unitarian Universalist Church, Unitarian Universalist Fellowship of DeKalb and the Unitarian Universalist Church of Geneva. Each choir will perform 3 songs. The concert ends with a 75 voice mass choir preforming several classic choral works. The concert will last about 90 minutes. To provide time for even more fellowship and celebration, the concert will be followed by a light supper. A free-will offering will be collected at this event. We hope you will come and support us and our neighboring UU churches in this inspiring and enjoyable musical outreach events.